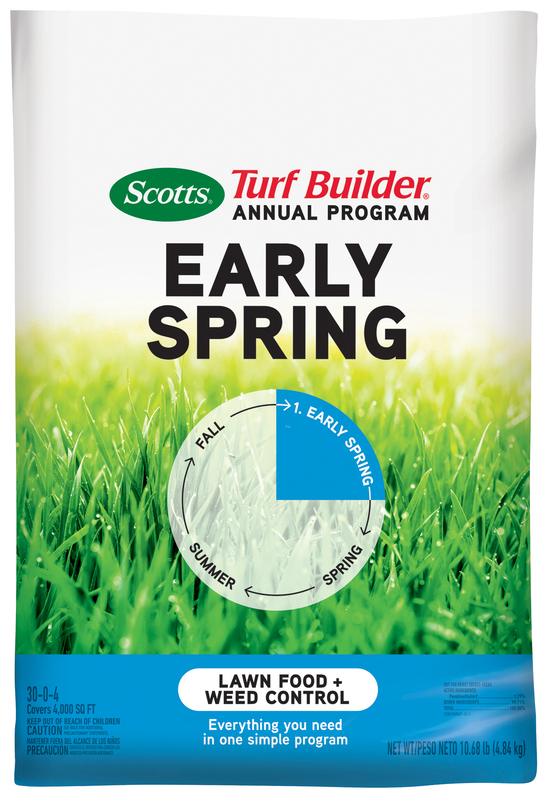 Scotts Turf Builder Annual Program is everything you need for your lawn in one simple program. Designed to provide your lawn with nutrition throughout the year. 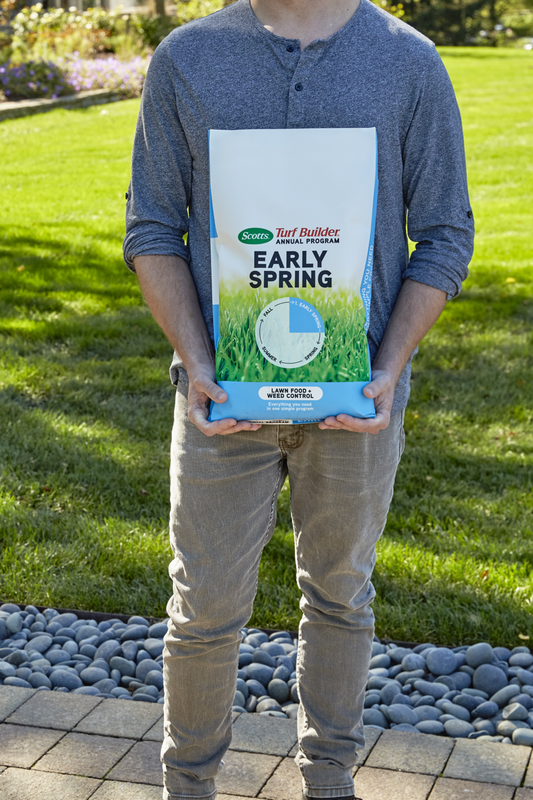 Scotts Turf Builder Annual Program Early Spring feeds your lawn after winter and prevents troublesome weeds, like crabgrass. Buy all four to keep your lawn strong all year long. Scotts Turf Builder Annual Program - One simple program for a beautiful lawn. Apply when lawn is dry and before temperatures are regularly in the 80s. 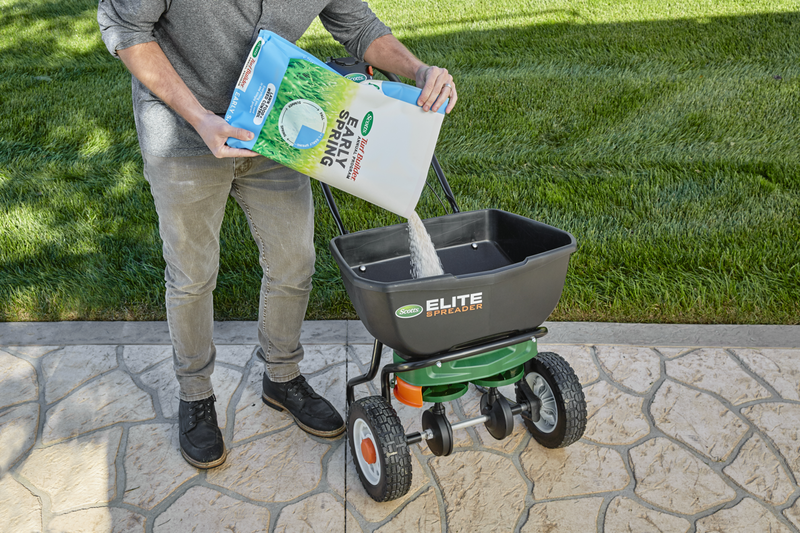 For best results use a Scotts® spreader. Early spring before the 3rd or 4th mowing of the year. Apply once in early spring. Do not apply more than twice per year. *For control a repeat treatment is recommended after 6-8 weeks. To protect the environment, do not allow pesticide to enter or runoff into storm drains, drainage ditches, gutters or surface waters. Applying this product in calm weather when rain is not predicted for the next 24 hours will help to ensure that wind or rain will not blow or wash pesticide off the treatment area. Sweeping any product that lands on a driveway, sidewalk, or street, back onto the treated area of the lawn or garden will help prevent run off to water bodies or drainage systems. CAUTION: Harmful if absorbed through the skin. Causes moderate eye irritation. Avoid contact with eyes, skin and clothing. This pesticide is toxic to fish. Runoff from treated area may be hazardous to aquatic organisms in neighboring areas. Do not enter or allow others to enter the treated area until dust has settled. Do not apply this product in a way that will contact any person or pet, either directly or through drift. Keep people and pets out of the area during application. Apply before 3rd or 4th mowing of the year. For best results the lawn should receive 1/4 to 1/2 inch of water from rainfall or watering within 2-3 days after application. One simple program for a beautiful lawn. Strengthen your lawn against heat and drought. Feed your lawn to build strong roots and maximize water usage.